We don’t want to brag or anything…scratch that…we really DO want to brag. In just the first nine months of study in our two-year program, most of our students in our inaugural class have already been offered jobs (or in one case, got funding to start his own company)! And, yes, they still have 16 months to go to graduate. We could not be more proud of the success of our students and knowing that we have clearly done something right by them in offering the project-based curriculum that we have created. But we have to be clear, it is the students who really have done all the work, from the start, we have just set up the right environment and challenges for them. Level 2 – A step-by-step challenge during which applicants create a website. At this level, the candidates are encouraged to begin collaborating, an important component of learning at the school. Once at the school we give the students progressively more difficult challenges– like waking them up at 2am to fix their servers! Teaching them to learn, not just to spew back facts they memorized. One student even had a summer internship at NASA SETI. This success further goes to show that students from any background, from high school to a cashier at Trader Joe’s or from teacher to customer support representative, all have the same opportunity to create the success that they crave by applying themselves in this self-learning method. So, where have our students been hired? Our students have been hired by promising startups but also some of the biggest names in technology, while some others have started their own companies and have even raised the starting capital! Many of our students will be moving on as high paid, Software Engineers at companies including Docker, Apple and Dropbox. And if that wasn’t amazing enough, one of our students has been hired at HealthTech, a startup company that had interviewed 100 other candidates before deciding on our student! For those out there who are aspiring to be like these students, the registration for our January class is now open for enrollment. Also, check out the video below to learn more about our student backgrounds, we accept students from all walks of life. Holberton School and Gandi will have the opportunity to work side-by-side on training the next generation of Highly skilled Software Engineers. We are proud to announce a partnership with the leading domain registrar and hosting company Gandi, joining us in the mission to train the next generation of full-stack software engineers. 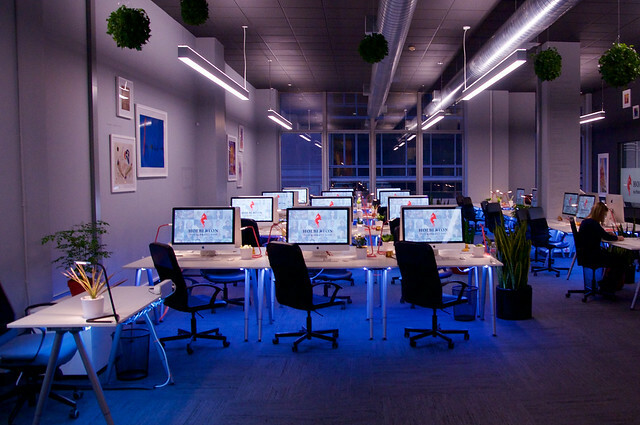 Holberton School has expanded into Gandi US offices, where it will use the 12 spots to welcome more wannabe full stack software engineers. Gandi has already been supporting us by donating server access, domain names and coaching with multiple DNS keynotes given by Gandi CTO Pascal Bouchareine. The office is conveniently located 5 minutes away from Holberton School HQ, on the same block as the new San Francisco Transbay Transit Center in the middle of SoMa, surrounded by startup and Tech companies like LinkedIn, Algolia, Twitter and Uber. Holberton School’s mission is to train anyone to become a Software Engineer using a project based approach: no formal lectures, everything learned by practicing. We heavily collaborate with companies via our network of mentors that Gandi CEO Stephan Ramoin is also part of. Students will now have the chance to be trained along to the talented Gandi team. Companies creating web applications spend most of their time and energy on building the product: identifying the needs, building storyboards, designing, developing, testing, marketing and pushing to production. Then the Operations team becomes responsible for the work the whole company puts together. That’s obviously a very important and critical responsibility, Operations teams have to juggle between stability, by making sure that the product is always available, and agility, to support product evolution (described in the concept of Bimodal IT designed by Gartner). Yet no schools are training students for these responsibilities and it is very challenging for the industry to find skilled professionals. That’s why Holberton School has a system administration and DevOps track, training students to deploy, monitor, scale and be responsible for the uptime of the product that they built. Incident management becomes a mandatory tool. And that’s why we decided to partner with PagerDuty — to give students access to the best tool to support their uptime. A great incident management tool allows engineers to engage not only the Operations team but other teams, in maintaining the product uptime and performance. This by allowing flexible schedules and escalations policies. On-call developers should have better insight on application-related issues, act faster, which reduces the time to resolution and helps to build a culture of trust and transparency. For junior staff it allows them to quickly gain knowledge by exposing them to every level of the escalation path, at first by shadowing more experienced staff and by then putting them in first line where they can quickly escalate if they are uncomfortable with the issue. By following the sysadmin/DevOps track at Holberton School and using PagerDuty, students will be able to deliver on agility, performance, and uptime during their time at the school and career. The first international Botathon organized by VentureBeat, San Francisco edition, took place at Holberton School. The school is training full-stack software engineers with an innovative approach: no formal teachers, no lectures, students learn by working on projects and happened to be learning about deep learning and neural networks which recently rapidly evolved — offering great opportunities to build the bots of tomorrow. The goal of the Botathon was to build bot prototypes taking advantage of these recent improvements and to explore market possibilities. It is interesting to notice that most bots used Slack or Facebook as communication channels, reducing user friction and acquisition but also leading to harder monetization strategy. Bots makes users life easier: tracking food intake (Amino), finding the dream home (Real Estate Assistant), booking your next restaurant or doctor appointment (Host Buddy)… The oddest (in my opinion) (Stop,dating bot) was offering to let a bot handle a breakup with a lover over text message. Two bots were dedicated to the Tech industry: (Oxy) which allows developers to interact with their servers via a bot and (Ibo) a recruiting platform that would take care of chatting with the candidate, scan the resume and adapt the set of questions depending on candidate’s skills and how the candidate performs on give exercices. The winning team, composed of Omar Sharif and Mike Chang built a waiter replacement: Botender. Contrary to other hacks, the bots was using SMS to taking customer’s food orders, menu questions, payment and even bill split(Stripe integration). Customers can quickly get their food and leave as soon as they want via a few text messages. For restaurants, they can reduce staffing and improve customer satisfaction with quicker and better service (the staff can focus on service and hospitality). And because Botender is over text message, it reduces the friction – no need to install any app. The hacks quality was very high and all bots actually worked. While we are at the beginning of the era and some bots might actually not be as efficient as our good old web forms, we are definitely creating interesting cases. The web industry is entering a new era where a big chunk of websites will be replaced by AI, it’s time for developers to start getting skilled! Nicolas Vincent Senior Software Engineer at TechCrunch is taking over Holberton School Snapchat account. Nicolas has been a Senior Software Engineer at TechCrunch since October 2012. As part of the dev team, he was one of the core developers for TechCrunch’s redesign in 2013. He is also a mentor at Holberton School. Prior to this, Nicolas was working as a Web Operation Engineer for the famous hospitality exchange website CouchSurfing. Born in San Francisco, but raised and educated in France, Nicolas graduated from EPITECH with a Master’s Degree in Computer Science. During his 4th year at Epitech in 2010, he attended California State University, Long Beach, and UC Berkeley for a yearlong exchange program. He will share what it is like to work for the most notorious Tech blog in the Silicon Valley, snap him if you have any question! I was studying a Master’s of engineering in Technology Innovation Management at Carleton University. I decided to pursue this degree because I wanted to create my own Tech startup. I had a great product idea, entered an incubator and I had plenty of meetings with interested investors. The biggest question that kept coming up was: “who will build the product? Who is your technical co-founder?”. So I decided to start learning on my own but it was too difficult, there are many resources online, but there is no structure and I did not know where to begin. The guidance that Holberton School provided through its project based curriculum and the exchange with mentors are teaching me the skills that I need to build a strong product for my startup. I used to work in a marketing consultancy firm, working closely with customers and the development team to iterate on the marketing analytics solution we were selling. The more time I was spending with the development team, the more I understood that their job was more interesting than mine. So I started to learn front-end development, for fun. I had not considered a career in the field at all. I had a strong preconceived idea that one should know everything about computers to be a Software Engineer. One day, I found out about Holberton School and started the application process, again for fun. When level2 started and we had to build a website, I became addicted. I felt that the experience was so self-developing for me… That’s how I discovered that this would be my next thing, something that I wanted to spend most of my time doing. I was in High School and also working as a delivery driver on the side, I realized my passion for computers in senior year of High School (even though we had no computer class). I knew for a while that I was attracted to software but I was not aiming to enter the industry. My dad and step-dad are both in the field and that helped me to get interested more about it. My dad realized how valuable Holberton School would be and told me that if I wanted to give a shot to computer science, this would probably be the best option. So I started the application process and I instantly realized that I loved it and wanted to start a career in the Tech industry. I had a strong interest in technology for a while, I started as a mechanical engineer major but soon realized that I was very interested in what was behind the scene, the “brain of the machine”, which is actually software. That’s why I decided to switch to computer science major, but it had more requirements, mathematics and physics classes, most of my time was dedicated to things that were not about what I wanted to do: writing code. I actually took 2 programming classes, the first one was about C++ and we never used a computer; we were writing code on a piece of paper. It was really boring as I never executed the code, I never understood what we were actually doing. The second class was a Java class, we were using a computer, but building useless and meaningless software, I did not see the point. Then I heard about Holberton School and then I got in! I graduated from a small liberal arts school where I studied community art and got a certificate in urban studies. I wanted to use art to change the city. I started to work for Apple in Chicago as a Sales Representative and quickly transitioned to Visual Merchandising. I also worked as a nanny one day a week for a family with five girls, which only left me with one day off per week. Then I saw my dad starting to teach programming at the high school level and enjoying it a lot. We were often discussing his experiences and I also had a lot of friends in web development who happened to also be artists, and they were encouraging me to try coding, so I went for it. Then I discovered Holberton School and the application process was so fun, interesting and nicely formated that I decided to take a chance and apply. Want to be part of the community and become a Full-Stack Software Engineer? Apply now! PS: Thank you Laurane Graulier for making this video! Tech companies in the Silicon Valley tend to pay more attention to what candidates can technically achieve rather than look at their credentials. An obvious way of doing that is by looking at code candidates wrote, having a Github account with up-to-date code is a must-have in today’s Tech industry. It gives the opportunity to potential employers to easily see a candidate’s coding style, what types of technologies they worked with, and their fun side-projects. That is also a the place where many open source communities are contributing on open source projects. That’s why Holberton School students will publish all their school projects on Github. In order to easily find the projects that have been done at school, their repositories will start by a “holbertonschool-“.